The point is well taken that the growth of the minority population depends upon future levels of immigration, and higher immigration means an earlier date at which the country becomes majority-minority. But between now and the 2040s there is a great deal more uncertainty about immigration trends than is captured in the Census Bureau’s latest assumptions, including uncertainty about how attitudes and norms will affect who is counted as minority. In addition, all three of the Census Bureau’s population projections use the same assumption about projected fertility levels of each race/Hispanic origin group. Not only are fertility trends difficult to predict over many decades, but different immigration levels will surely affect fertility rates. 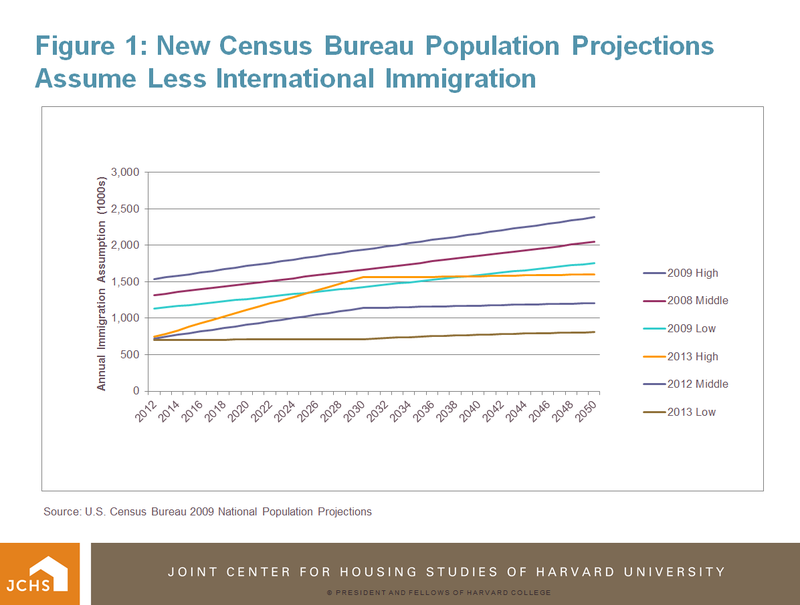 The new middle series immigration assumptions trend from 725,000 per year in 2012 to 1.2 million in 2050. Low assumptions trend from 702,000 to 808,000, and high assumptions from 747,000 to 1.6 million annually. 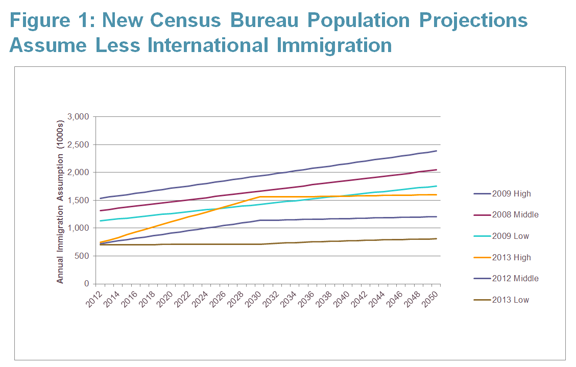 All three immigration assumptions are well below those of the previous Census Bureau population projections released in 2008 and 2009, with the new high immigration series even projecting fewer immigrants in 2050 than the previous low immigration assumption (Figure 1). Such a wide range of uncertainty about future levels of immigration should make one wary about the reliability of projections that reach almost 50 years into the future. However, the projected level of immigration is not the only area of uncertainty that will affect the projected white-minority tipping point. Predicting a specific year when the population actually becomes majority-minority sometime three decades ahead will also require assumptions about how Americans in the future will identify themselves in terms of race and ancestry. Perhaps the most important wild card is the growing rate of inter-ethnic/race marriages, particularly when one parent is non-Hispanic white and the other is not, both because the rates of intermarriage will help determine the future minority composition of the population and because it is unclear how the children of such unions will be classified in future censuses and how they will self-identify as adults. According to a Pew Research Center report, among all newlyweds in 2010, 9% of whites, 17% of blacks, 26% of Hispanics and 28% of Asians “married out." Most of these marriages involved one partner who was non-Hispanic white. The same report notes that during the past 25 years, public sentiment about inter-marriage has changed markedly: in 2010, nearly two-thirds of Americans said it “would be fine” with them if a member of their own family were to marry someone outside their own racial or ethnic group, while in 1986, two thirds of the population held the opposite view. During the next 25 years, marrying out is likely to become even more common and more widely accepted. Such trends in inter-marriage tell only part of the story regarding inter-racial childbearing, however. The percentage of births that are non-marital has been increasing steadily since the 1940s, and the greatest increases have taken place in recent years. Today, 36 percent of all births taking place in the U.S. are non-marital, with much higher percentages among teens (86 percent) and women in their early 20s (62 percent). Given that younger cohorts are more favorably disposed to inter-racial relationships, many of which result in childbearing outside of marriage, the statistics on inter-marriages in the Pew report could well underestimate the implications for future inter-racial/ethnic childbearing. The number of inter-marriage/partnerships taking place over the next 30 years, the number of children born to these relationships, and how the race/ethnicity of these children get classified in censuses and surveys will fundamentally affect the share of the population that is identified as minority. More importantly, how these children will self-identify as adults in 2040 is basically unknown. Census Bureau population projections tacitly assume that this variable is held constant at today’s levels, and that young adults will self-identify in the future the same way that they were identified as children by their parents. A strong argument has been made that racial and ethnic identity is highly variable over time and depends upon social and political conditions. In 1970, the question on Hispanic origin was added to the Decennial Census, and in 1980 the question on ancestry, both after concerted political lobbying by Latinos in the case of the former and those of European descent for the latter. The Asian community successfully lobbied to expand the number of Asian options listed in the 1990 census. However, since then the percentage of the population whose ancestry was not identified by the census has increased, slightly between 1980 and 1990, and dramatically between 1990 and 2000 (increasing from 11 percent to 20 percent). In 2010 the ancestry question was shifted to the American Community Survey. In that survey ancestry was unidentifiable or not reported for about 12 percent of the population, but only after a persistent effort with follow-up interviews with respondents having not answered this and other questions. Such follow-up was not conducted for the 2000 census. In short, ancestry appears increasingly to be less important in how Americans identify themselves. And if ancestry, and perhaps by extension race and ethnicity, becomes less important in how we self-identify as Americans, it is entirely likely that in 30 years the percent minority will become a statistic that has become less robust. Specifically, fewer persons of Hispanic origin might check that box. Likewise, fewer of mixed-race ancestry might identify as such. A third way that the majority-minority tipping date might be influenced are the apparently arbitrary definitions of whom the Census Bureau counts as minority. For example, immigrants from Brazil are not counted as minority (Hispanic/Latino) because of Portuguese ancestry, even though most Brazilians also have some indigenous South American native ancestry. Persons with ancestry in the Middle East and in North Africa are also categorized as white. But a future OMB directive could require that these persons be counted as minorities. Finally, it has already been demonstrated that such simple factors as questionnaire wording, order of asking questions about nativity, race and ethnicity, and examples used as prompts to questions, will all influence responses. It is very unlikely that current questionnaire protocols for these items will be used decades in the future. While there is a lot of uncertainty about the projections 30-50 years into the future, the new projections for the next 10-20 years are likely to be much more accurate. And they are extremely valuable for showing the magnitude and importance of different immigration assumptions for relatively near-term trends in population growth and for broadly understanding the changing age, race and ethnic composition of the population. Longer-term trends in race and ethnic composition will depend as much on fertility levels, on rates of intermarriage, and on how we think about others and about ourselves, as it does on actual immigration trends.